You've come to a great place to shop for Theater Gifts! We're going to try to meet all of your shopping needs in this category and will constantly be changing our selections. Pick Up This Great Recording (Perfect Valentine's Gift) From... Wicked's Original "Glinda" the Broadway actress, Kristin Chenoweth. Teen and kid performers will be delighted upon receiving the perfect theater gifts. 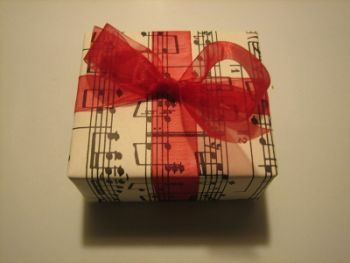 With a little imagination you will have no problem finding gifts to please all the theater people in your life. Keep in mind that Musical Theater Kids as "Triple Threats" are involved in Dance, Drama and Song. Some of these kids are even "Quadruple Threats" as they play an instrument, too. So take it from there. The following is a list of gift... possibilities. These are some of the things that I have found over the years have pleased the Musical Theater Kids, both the little kids, the older kids and the "not so little"... in my life. Please feel free to send me your suggestions and I will be be sure to add them to this list of theater gifts ideas. Theater Tickets for a Favorite Musical or Drama. can be found at this link. You can also find favorite actors and films. Dance Gear including Dance Shoes, Pants, Leotards. Look for name brands such as Capezio, Bloch and Leo. and decide what your theater kid would like. Costumes - Theater Kids always love them either for a part teh're playing or even for a costume party. There are many types of costumes available from this great company. Theatrical Make-Up...Stage Make-up Instruction Kits. Purchase the Name Brands including; Ben Nye, Mehron, Kryolan, and Splash. They go the farthest and offer the best effect. Microphones, Amplifiers ...and their accessories. All the gear needed to listen, view, record, performances including: Ipods, MP3 players, Mini Voice Recorders, Cameras, Video etc. Chocolate Makes A Great After Performance Theater Gift! This theater gift list is by no means complete and is simply meant to get all of you gift givers thinking about the possibilities. I will add to this list from time to time and of course, welcome all suggestions. In the meantime, Happy Gift Giving!